When you specify your shutters, you have the option to choose whether you would like to receive your shutters raw or primed. 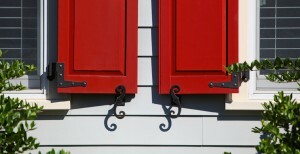 If you choose to have your shutters delivered raw, your shutters will come pre-sanded and ready to prime and paint. If you choose to have your shutters primed, your shutters will come with two coats of industrial primer and will be sanded smooth ready to receive two coats of finishing paint. As you can see, choosing the right shutter, crafting it from the finest materials, taking the time to seal and finish the shutters properly, you can have an authentic material without the maintenance that the plastic shutter manufacturers claim you will have.